We visit the museum and secret hide- away of Nelson Mandela and where the military overthrow of the Apartheid government was planned and commenced. This is the start of the Robben Island Story. The story of the events leading up to and the arrest of the leadership is told. Constitution Court and Number 4 Prison. One of the most impressive courtrooms in the world and totally unique. Also the sites where Mandela was imprisoned as well as Ghandi. Voortrekker Monument. The bastion of Afrikanderdom. Hear you will share in the incredible story of the Voortrekkers and begin to understand some of the hardships and struggles of the Boers. We provide a political synopsis of events leading up to Apartheid in 1948. Then onto Liliesleaf Farm, the scene of the Rivonia Raid in 1963. Constitution Court and the Fort are then visited. Built by Paul Kruger as a prison in 1893, later converted to a Fort after the abortive Jameson Raid” and then finally serving as a prison right up until 1983, the visit includes the old Fort. This is where Nelson Mandela was imprisoned on two occasions, as well as other leading South African struggle heroes. The Fort, initially built by Kruger to imprison the “Uitlanders”(foreigners) who worked on the gold mines, is located next to the new Constitution Court. Before going into the Court we visit “Number 4” prison- This was where thousands of black prisoners were imprisoned for offences ranging from “pass offences” to political activists. 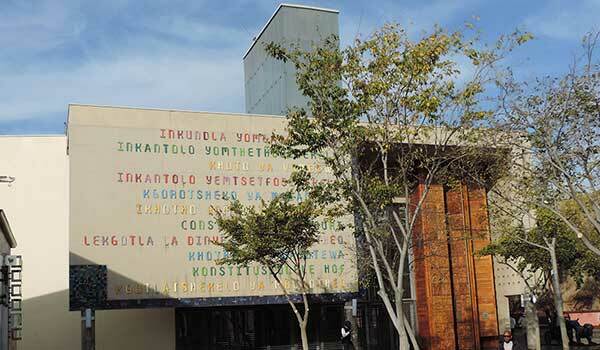 The exhibits paint a chilling picture of how South Africa treated its criminals. In contrast to Number 4 we then visit one of the most sophisticated courtrooms in the world- South Africa’s Constitution Court. The Court, its design, emblems, symbols and logos are explained and visitors are taken into the courtroom. Depending upon the day and whether or not the court is in session, it is possible to sit and listen to the proceedings of the highest court in the land. Then we drive to Pretoria and visit the Voortrekker Monument. Inside the Monument the story of the Great Trek is told as is the killing of Retief and the Battle of Blood River as well as all 27 friezes described. The significance of December 16th and the Vow are told in detail. The History is told from a traditional ‘white” perspective as well as from a Zulu perspective. We visit the farm where the Death Squads operated. Special permission to do this is obtained from the Government. It is believed that more tan 1000 people were killed at or from Vlakplaas, Stories of the atrocities are told and sites visited on the farm where torture and killings took place. NB. This part of the tour is NOT considered suitable for children, under the age of 12. SPECIAL PERMISSION TO VISIT THE FARM HAS TO BE OBTAINED FROM GOVERNMENT SO A MINIMUM OF WEEKS IS REQUIRED TO DO SO.